Indeed, Wessel is lucky to be alive. But there was something more than just luck involved here. He also was fortunate that three people familiar with emergency procedures were in attendance at last Wednesday’s Class 2A Section 6 softball tournament game between Long Prairie-Grey Eagle and Minnewaska in Wadena. It was fortunate that Jay Stewart of Glenwood and Gary Bentz of Browerville were at the game; they both are trained first responders. It was fortunate that Long Prairie police officer Ryan Hanson was there, too. When Wessel, 51,collapsed on the infield after the fourth inning, Stewart, Bentz and Hanson came running. They began chest compressions and performed mouth-to-mouth resuscitation. Twice, Wessel stopped breathing and began turning blue. But twice, his rescuers brought him back. “I looked down at him and there was blood coming from his nose,” said Hanson. “I didn’t have a mask like I would if I was on duty, but I knew if I don’t give him air he’s going to definitely die. Dan is in his 29th year as an MSHSL official, having worked wrestling, softball and baseball. He has worked several state wrestling tournaments as an official and an evaluator of officials, and he has served as a charter clinician for the St. Cloud Wrestling Official Association. Oja and Wessel don’t umpire together very often, but they know each other very well. Oja is a retired teacher and coach in Melrose and Wessel was a student there and played for Oja. “It was kind of surreal from that standpoint, as well,” Oja said. When Wessel collaposed, Oja had a pretty good inkling of that had happened. Hanson, who has been a police officer for 15 years and also is an assistant coach on the Wadena-Deer Creek/Long Prairie-Grey Eagle cooperative girls hockey team, guessed that he had performed life-saving procedures five to 10 times previously. That wasn’t the case for everyone on the scene. The next day, Oja was working a game at Minnewaska in Glenwood when he struck up a conversation with a woman who was aware of what had taken place in Wadena. Josh Rocheleau doesn’t want any special treatment and he doesn’t want anyone to feel sorry for him. The sophomore from Pierz just wants to be one of the guys, and that’s exactly what he is. Josh is a member of the Pioneers’ varsity golf team, he’s a manager for the football team, he’s a huge sports fan and he has a great smile. Yes, it’s something really serious. Josh, 16, has undergone numerous surgeries. “I don’t know,” he said, “about five or six surgeries.” The most recent surgery took place when he was 10 years old; a pacemaker was placed near his heart in that procedure. He will have more surgeries as he gets older. Josh is a big Minnesota Twins fans and is a regular at Pierz sporting events. He described his duties as a football manager thusly: “I get everything ready for the players. I like it.” He uses a golf cart in his football duties, and sometimes will drive a cart during competitive rounds of golf, too. That’s because of his heart condition. He has received a waiver from the MSHSL to use a golf cart when needed. He’s usually fine when walking nine holes, but playing 18 holes or any number of holes on an especially hot day can lead to using a cart. Josh keeps himself hydrated on the course, which is important. And when he drives a cart, other players who don’t know him will usually inquire. Josh would like to participate in other sports but he realizes that danger of doing so. “I wish I could play way more,” he said as he smiled again. Not long ago he began working at Eagles Landing Golf Club in Fort Ripley, where his job entails working with, yes, golf carts. --To see a photo gallery from Thursday’s Central Minnesota Conference boys golf meet at Shamrock Golf Course in Corcoran, go to the MSHSL Facebook page. As in most Christian high schools, a credo of faith, school and then athletics is followed by the athletes and coaches in the softball program at New Life Academy of Woodbury. The difference between the Eagles and the much of the rest of the state is the success that formula has brought the program. Since 2006, head coach Mick Ramey, his staff and athletes have advanced to the Class 1A state tournament every year. They are gearing up for what they hope will be their eighth straight section championship. If they get there, they will tie the Minnesota record for consecutive section championships. During this stretch they won a state-record four straight state titles between 2008 and 2011. One of the keys to maintaining such a long run of excellence goes back to sticking with a system that is based in faith, school and sports. Ramey started his coaching career in the Cottage Grove Athletic Association, coaching his kids in various sports. He was also a longtime board member for the association. He started coaching his boys and then as his girls got older he moved more toward their sports and eventually the sport his girls gravitated to – softball. He became the New Life head softball coach in 2006. Although the team was young, the players had previously worked with Ramey so they all knew the system. With such a young team early on, it laid the foundation for the extended run of championships. The Schmidt sisters, first Danelle and then Rebecca, set the tone and the program has had a number of good pitchers -- especially during the four straight championships. The turning point for the program occurred while defending their first state championship. During a season that would end up with state title number two, the Eagles entered a regular-season tournament that put them up against the best team in the state. In order to maintain that confidence, execution needs to be second nature. In practice the team focuses on what Ramey calls the Big Three. The Big Three has paid off. New Life has had a remarkable run of victories in one-run games. Ramey estimates they have had 25 one-run games over the years and have won about 21 of those games. Another reason the girls have been so successful in the close games is that they are used to tough competition. Ramey schedules a number of bigger schools to go along with his conference schedule. His “iron sharpens iron” philosophy started out of necessity. Maintaining such a high level for so long is a tribute to the coaching staff the Eagles have in place. One of the impressive aspects of this run of championships has to do with the small pool of athletes that New Life has to pull from. Sometimes they don’t have any players from a certain class on the team. After winning their first two titles they almost couldn’t field enough players to form the team that would ultimately win the third straight title. The system Ramey has in place has helped maintain enough numbers. Since he does not work in the school system, he has had to rely on the kids. This year’s team was able to build on an unexpected playoff run last year. Each year the veteran players do a great job of teaching the younger kids the system, making Ramey’s job easier. As Ramey said, it is the responsibility of the older girls to pay it forward and help the program not just during the current year, but down the road. This year’s team – like countless others – has been aided by that “pay it forward” system and some of the players have grown into great leaders. Val Hohol and Malorie Gierie are the main pitcher and catcher, Chloe Westlund is the leadoff hitter, Amanda Heidmann has been manning third base for three years and Nicole Johnson is the team’s leading power hitter. It’s yet to be determined of New Life Academy will win another state championship this year. But if the Eagles stick to both of their Big Threes – in softball and in life – they are sure to be in the mix for years to come. HOUSTON, Minn. -- Bailey Proudfoot doesn’t remember the February morning when her car careened on an icy road and collided with another vehicle. She doesn’t remember the first week following the accident, which she spent in a LaCrosse, Wis., hospital. After eight broken bones (including her throwing arm), multiple surgeries, weeks of therapy and rehabilitation, Monday was a special day for Bailey. Eleven weeks to the day after the accident, she returned to the softball field as the Houston Hurricanes defeated the Mabel-Canton Cougars 10-0 in a Southeast Conference game. “She is hands down the toughest kid I have ever met,” Houston athletic director Casey Indra said. Playing with a metal rod in her left femur and determination in her heart, Bailey hit a sharp liner to right field in her first at-bat. She was thrown out at first base but moved runners to second and third. She later walked twice, replaced by pinch runner Becca Lee. “You ought to be smiling from ear to ear,” a very happy Houston coach Arlin “Pete” Peterson hollered from the third base coaching box as Bailey stepped in to hit for the first time this season. As she returned to the bench after the play, her teammates and hometown fans gave her a big round of applause. Bailey, who normally plays catcher, put on shin guards and helped pitcher Abbey Loken warm up but played left field Monday. Her sister Becca, a junior, took over behind the plate as Loken struck out 11 and gave up two hits. Just having Bailey back with the team and in the game was reason enough to rejoice. For anyone who saw Bailey’s car – or photos of the damage – it’s remarkable that she is alive, much less walking or running or playing softball. The dashboard and steering column were rammed into the driver’s seat and she was pinned there until emergency personnel freed her. The accident occurred four miles from the Proudfoot home. Bailey’s main goal was to walk at the prom. That event was held two weeks ago, and walk she did, as well as dance. And now that she’s back on the softball field, life couldn’t get much better. Bailey said she is grateful to be alive. She spent 15 days in the hospital and stayed home for another week and a half before returning to school. She didn’t spend a single day on crutches, which is a testament to her determination. And her final season of high school softball was a good pretty strong factor, as well. Her parents, Kim and Bruce, weren’t sure how quickly Bailey would be back to normal. There will be no worries about that when the Houston High class of 2013 graduates on May 31. In the meantime, the softball season will continue. The Hurricanes, who have a record of 9-2 and are ranked 10th in the state in Class 1A, will begin Section 1 postseason play next week. “This is what she lives for,” Kim said of her daughter. She sure does. And she sure did. --To see a photo gallery (plus video) from Monday’s softball game between Houston and Mabel-Canton, go to the MSHSL Facebook page. I wanted to pass this along to you. My name is Nathan Johnson and I am a teacher/coach and newspaper adviser at Proctor High School. I get the Bulletin from the league and enjoy reading the letters on displays of sportsmanship. I wanted to share an example that happened to the team that I help coach. Proctor attended the True Team Section Track meet in Chisago Lakes. The weather was great and the meet was wonderful. On the way down one of our two buses broke down. We only had one bus to try and take everyone home. We have five coaches and had taken about 70 athletes to the meet. Needless to say we weren't going to fit everyone on one bus for the drive home. I approached the coaches from Hermantown to see if they had any room on their bus. Hermantown and Proctor High School are close (less than 10 miles apart). We have a BIG rivalry with Hermantown. One of the highlights of our school year is the football game where the winning team takes home the "Hammer." Last year approximately 2,500 to 3,000 fans showed up for the game and it was televised on local TV. This is a wonderful rivalry that also extends to other sports. When I asked if Hermantown had room, they offered to help out in any way. We ended up sending some of our athletes home with them. Hermantown coaches and bus drivers were awesome. They displayed a great deal of sportsmanship. They also were able to teach BOTH of our teams that rivalries don't have to always be competitive. We can help each other out, as well. I believe that this episode shows why sports and extra curricula are vital to our students. Hermantown displayed the best of the values we all try to teach our athletes. A few days ago I invited people to share their thoughts about the spring that never wanted to be sprung. These recent weeks have certainly been a challenge, with games postponed and cancelled all over the state during bad weather … and a rush to reschedule contests as the weather improved. Some people don’t realize all that goes into holding high school sporting events and other activities. From buses to ticket takers to concession workers to game officials and beyond, the logistics can be daunting even during the best weather conditions. The biggest issue, at least for me, is the abundance of doubleheaders that now are being played. We as spring officials understand that the weather will force game changes and such and have become used to this. However, this spring has been extremely difficult. When you work a regular job and then officiate you end up usually taking some time off work in order to get to games on time. With the number of doubleheaders now it makes it difficult as leaving now earlier than planned and more often. We are really trying to balance our careers with our love of umpiring as well. We have had six meets cancelled. Finding a meet or meets is now becoming scarce or difficult. We had to get our track teams in for the Lakeville North meet scheduled for May 20; those schools are probably 10 times bigger than ours but we have to get our girls and boys prepared in time for subsection and section. This is by far the worst spring I have seen as a former student here at Minnesota State Academy for the Deaf and as AD in my 30 years. I have asked my track coaches to stay positive with our girls and boys. They were very creative in making their practices more enjoyable. If they practice in our gym, they would set up some kind of games that requires a lot of running. Just to get them motivated for the practices. As an AD I found myself getting lulled to sleep because nearly every day for awhile there was not a chance of playing, so I'd contact my fellow ADs and postpone the games without too much thought to other details such as game site workers, field prep, concessions, etc. Then when we had a stretch of good weather I found myself doing double time to make sure all areas were covered so that we could indeed play. I'll be happy to be back in that stressed mode again! As a coach I've had to concede that we won't be able to get the quality practice time that I like, since we'll be cramming in a lot of games. But the kids signed up to play ball so when we have a good day I think it is important to give them the game experience that they enjoy. Twenty years ... the worst I've seen. The amazing thing to me is the resilience of our kids and coaches, AND the patience of our support team (administrative assistants, busing personnel, building secretaries, etc.). Years from now we'll look back and say we survived the Spring of 2013! Lucky '13? ... I'd say NO! Wait, Wait, Wait … OK, Stillwater Ponies, It’s Time To Play! Imagine this scenario: It’s your senior year, your team is the defending state champion and you absolutely cannot wait to get back on the field and start a new season … and then the weather stops you in your tracks. Cold. For the softball team at Stillwater High School, that is not a scenario. It is reality. The Ponies won the Class 3A state championship a year ago, lost only three senior starters from that team and were all charged up for 2013. And we know what happened. Snow. Ice. Rain. Games cancelled, schedules disrupted, a season put on hold. Before sunshine and warmer temperatures arrived this week, Stillwater had seen 16 softball dates wiped out by the weather. But the Ponies have saddled up and returned to action in a big way, with games scheduled every day this week. On Monday they beat Woodbury 9-4 in the first game of a doubleheader and Woodbury won the second game 2-0. The Ponies defeated Cretin-Derham Hall 3-0 Tuesday (giving them a record of 7-2) and will meet East Ridge on Wednesday, Forest Lake on Thursday and Cretin-Derham Hall again on Friday. There is indeed a mad dash – in all spring sports -- to play a full schedule of games before the postseason begins. Softball teams can play 20 regular-season games, and getting them all in could be an issue. For Stillwater, the Section 4 tournament will begin on May 20. Playing so many games in such a short time frame means playing doubleheaders, which is not usually the case. Beedle said the players need to maintain their focus in those situations. Ah yes, the gym. That’s where most spring athletes all over Minnesota have spent day after day. Waiting for the weather to improve, coaches and athletes worked on skills while also trying to inject some fun and avoid boredom. The Ponies did a lot of games and team-bonding activities, and also enjoyed days away from the game. “We did give kids a day off once in a while,” Beedle said. “I think if you’re pushing too hard, there’s a point of no return in terms of what you’re going to get out of them. If the weather continues to cooperate, spring teams will be grateful. Even if it means playing a large number of games in a short amount of time. --To see a photo gallery from Monday’s Woodbury-Stillwater softball doubleheader, go to the MSHSL Facebook page. --St. Francis senior Maggie Ewen broke her own girls state discus record with a throw of 175 feet, 9 inches in the Class 3A Section 5 True Team meet at White Bear Lake. Her previous record was 172-7. --Lakeville South senior Lee Bares broke the boys state record in the pole vault with a height of 15-9 in the 3A Section 1 meet at Lakeville North. The previous record was 15-8, set by Moorhead's Macauley Spandl in 2010. Ewen's 175-9 discus throw ranks No. 2 in the nation among high schools girls this season (the best throw is 184-2). Bares' 15-9 pole vault ranks No. 33 nationally among boys this spring the (the leader is 17-8 1/2). 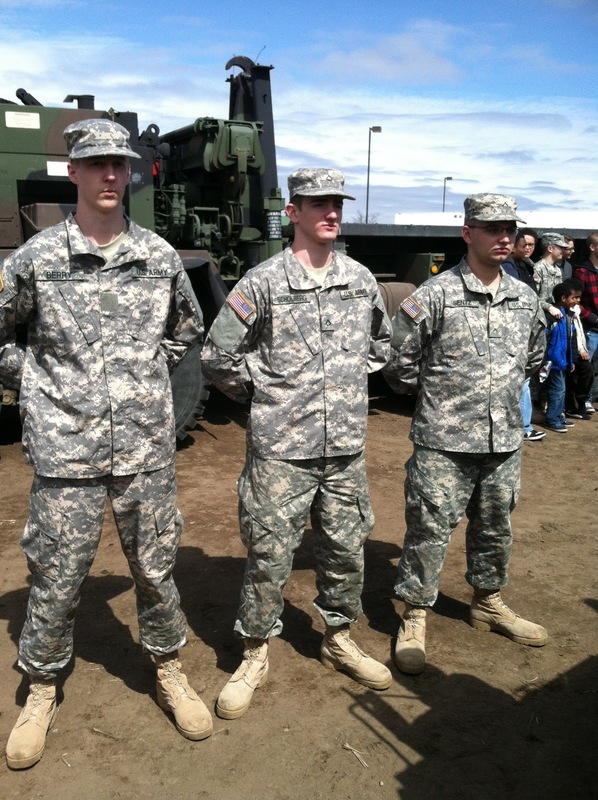 --Sentz: “I joined the National Guard because I felt it was the right thing for me. I’m proud to be an American and wanted to serve my country.” Ryan will be attending Basic Training at Fort Jackson in Columbia, South Carolina this summer and advance training at Fort Sam Houston in San Antonio, Texas in summer 2014. At the end of his advanced training Ryan will be a Combat Medic. This fall, Ryan plans to attend North Dakota State University where he will study mechanical engineering. --Berry: “I knew in my heart it was the right thing to do and I wanted to serve my country. The National Guard will help me with leadership and team building skills. I was already accepted to the University of Wisconsin, River Falls when I made my decision to join the National Guard. With already having 1 semester of college credits from attending PSEO, I have chosen to defer my college for one semester so I can do both my Basic Training and AIT training back to back. I will start college Spring of 2014 and study Health & Human Performance." Seth will leave for Fort Sill, Oklahoma on June 24th and then head to Fort Lee, Virginia September 10th. While attending college, the young men will also serve one weekend a month and two weeks per year as part of their service. Apple Valley High School is fortunate to have such great leaders walking the halls and our nation is lucky as well. On behalf of AVHS, thank you to Ryan, Seth, and Jackson for their service to this great nation. As another stretch of bad weather rolls across much of our state -- resulting in more postponed and cancelled spring athletic events and contributing to what has become the worst spring in memory – I’m inviting everyone who is dealing with the conditions to pitch in and share your thoughts about the spring that never wanted to be sprung. --Athletes: How frustrating has this spring been as you work out indoors and wait for the weather to improve? Seniors, what has this spring done to your final season of high school athletics? And on the flip side for all athletes, have you had more time for things other than sports, such as studying? --Coaches: What have you learned this spring? What kind of creative methods have you found to keep your athletes engaged? How frustrated are you? How will the lessons learned this spring pay off in the future? --Athletic Directors: Does any previous spring compare to this one, in regards to trying to re-schedule events and find ways for your athletes to compete? How much time have you spent on this challenge, compared to other years? Is it a struggle to remain optimistic and encouraging for your coaches and athletes? --Officials: You are sometimes the forgotten group in situations like this, but your lives and officiating schedules have been equally distrupted. What are the challenges you have been facing in trying to keep up with postponements and cancellations and the re-scheduling of events? Are you doing anything to keep your skills sharp? --Fans: How have your lives been disrupted, especially if you are parents of athletes? How have you been encouraging your athletes to remain positive? And finally, what are your keys to staying warm and dry when watching outdoor events in, uh, less-than-ideal conditions? Please send your emails to jmillea@mshsl.org … and keep your fingers crossed for better weather! On a daily basis, I scan a whole bunch of high school athletic schedules and calendars in an attempt to make plans. Some plans are down the road a week or two or three and some are immediate. The latter was the case Wednesday, with predictions of snow on May Day. I assumed that baseball and softball games would be wiped out by the rain that fell most of the day, and this assumption turned out to be accurate. My thoughts turned to lacrosse, with the realization that lacrosse players are rough and ready when the conditions are far from perfect. The Suburban East Conference had a full slate of boys lacrosse games on Wednesday’s docket, but one stood out: Forest Lake at Hastings. That game stood out because it was going to be played on natural grass. The Hastings lacrosse field, on the grounds of the high school, is bare bones (no bleachers, no scoreboard) and I guessed it would be a perfect setting for what I envisioned: Lacrosse in the snow and the mud and the muck. And boy oh boy did I get what I wanted. The teams from Forest Lake and Hastings played Wednesday evening under conditions that could be called “tolerable” by some and “brutal” by others. Heavy, wet snow mixed with raindrops covered everything – and everyone – in wet soup. The MVPs (Most Valuable Plowers) were a couple of fathers who used snow shovels to repeatedly clear the sidelines and center line so the players and officials could see where the ball was. It wasn’t easy. Sam McGree, Andrew Cordell and Colin Shoen each scored twice to lead Hastings to a 9-8 victory. But for both teams, the outcome won’t be as memorable as the conditions. As the game wore on, the moisture kept falling and everyone – including spectators – got wetter and wetter and colder colder. The scorers table was protected somewhat by a portable roof tent, and a small heater was placed on the table under the tent. At halftime, players held their hands and the inside of their gloves over the heater. Jenson is a 2003 Hastings graduate who played lacrosse at St. John’s University and also is the head coach of the men’s club lacrosse team at St. Olaf College. He said he has played and coached college games in similar conditions, but those were on artificial turf. After seeing three home games wiped out by previous bad weather, Wednesday’s game was the first at home for Hastings. And the Raiders looked sharp, wearing new white uniform tops ... even if the coach second-guessed that decision. --See a photo gallery from the snow-swept lacrosse game on the MSHSL Facebook page. Red Wing baseball player Ryan Boldt and softball players Dana Morgan of Forest Lake and Anne Debertin of Visitation all have made college commitments, but this spring's poor weather has resulted in a slow start to their senior seasons. Brian Jerzak writes about how the trio is dealing with the situation. Read his story by clicking here.